Butternut squash noodles are my favorite new discovery! They’re a delicious gluten-free, low-carb alternative to pasta but more substantial than zucchini noodles. 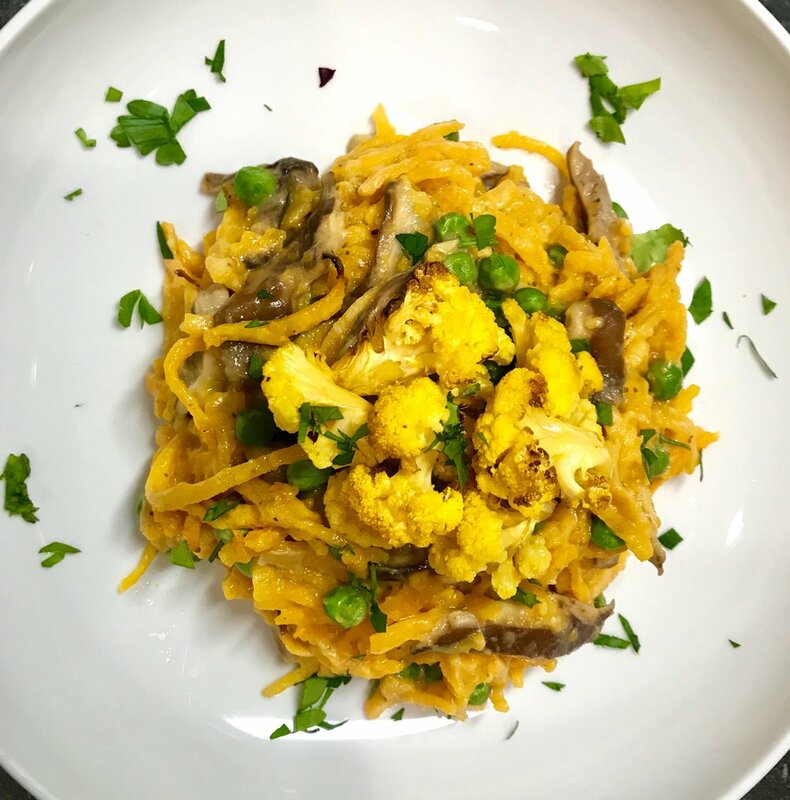 This dish tasted even better than I expected – it’s rich and creamy with just the right amount of sweetness that really makes you feel like you’re indulging, even though your plate is all veggies and packed with vitamins, minerals and antioxidants! This recipe is a sure bet so go ahead and give these fiber-filled noodles a try! Toss cauliflower florets with oil and spread on baking sheet. Season with salt and pepper. Roast for about 20 minutes, toss and roast for additional 10-15 minutes until starting to turn brown. Remove from baking sheet. Toss butternut squash noodles with olive oil and place on same baking sheet and roast for about 10 minutes in oven until tender. Next, melt 1 tablespoon of ghee in a medium saucepan or skillet over medium heat. Add minced shallot or onion and garlic and sauté until tender, but now browned, about 5 minutes. Add milk and nutritional yeast. Cook for a couple of minutes, stirring until everything is combined and fragrant. Remove from heat. Transfer contents of the saucepan into a blender or food processor. Add most of the roasted cauliflower – saving a handful of pieces for garnish. Add ½ cup of water and season with salt and pepper. Process until very smooth and creamy, with a texture similar to traditional cream sauce. Add more water if necessary. In the same saucepan or skillet add another tablespoon of ghee. Sauté mushrooms for 4-5 minutes, turning until lightly browned. Add peas. Finally combine the butternut squash noodles, sauce in the skillet with the mushrooms and peas over medium heat. Stir until squash gets nicely coated and creamy. Garnish with a few cauliflower florets and chopped parsley.